I've always been interested in history, particularly when it involves tea. Lately I've been curious about US tea history and have done a little digging for previous posts. I recently ran into information involving tea and women's rights both here and in the UK. This post skims the surface on the subject matter, as I don't want this to get too lengthy. But I think it's interesting and quite relevant to today. This post has a political slant to it, but it's all in the name of tea and humanity. There may be those who scoff at the idea of investigating ‘Suffragettes and Tea Rooms’, but political movements need sheltering spaces in which views can be exchanged. During the 19th century women attended hundreds of suffrage meetings in Britain’s town halls and assembly halls – and, if suitably couth, in the drawing-rooms of the better-off, but there were few places outside the home in which they could congregate informally. The WSPU commissioned a tea set from her in 1910 for their refreshment stall at the Scottish WSPU Exhibition in Glascow, and another set by her featured an image of the Hollaway Prison Badge that was awarded to women who were locked up in the prison for their militant pro-suffrage activities. 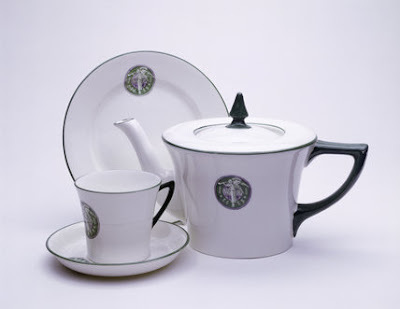 Sylvia Pankhurst designed quite a bit of teaware for the movement, including the set you can see below. This set was designed for sale at the the Women's Exhibition in 1909. If you are interested in learning more about china commissioned for the movement, this article is a good place to start. Lucretia and Elizabeth had, in London several years previously, vowed to hold a convention about injustices suffered by women, and so while the tea party probably started as a calm affair, it quickly became the launch pad for nothing less than the Seneca Falls Convention. The Seneca Falls Convention was the first US women's rights convention. 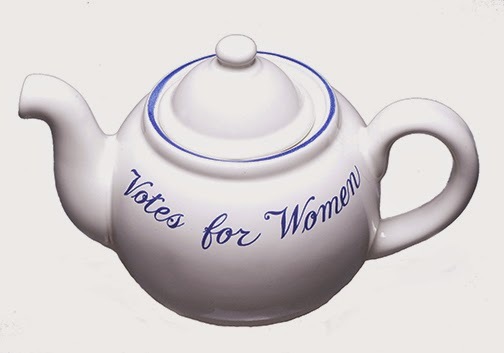 Decades later in 1914, tea continued to foster the fight for women's rights when well-connected and dedicated Alva Vanderbilt Belmont hosted a 'Conference for Great Women' and commissioned porcelain tableware including a teapot with 'votes for women' emblazoned on the front (you can see a photo of the teapot at the top of this post). The table ware was used as part of the luncheon at the meeting and also for a tea party held later that year. The events raised money for the suffrage movement and guests and each event took home 'votes for women teacups and saucers. Tea was literally helping to get the word out! The tireless efforts of these strong women were rewarded in 1920 with the addition of the Nineteenth Amendment granting women the right to vote. As I mentioned there is much more that can be said on this topic. There are so many more diverse, strong and influential women that haven't been discussed. But what can we learn from this history? Tireless work, dedication and hope, along with gathering together (over many pots of tea) is needed now more than ever to activate change. I hope tea continues to bring women of all cultures and backgrounds together to fight and get our voices heard. Can tea really help create change? It's easy to fall into the 'tea is about sharing and being mindful and at peace' camp, and that's beautiful but it's just not enough. I know many of my own politically charged conversations have taken place over cups of tea. Perhaps it is the way to open up the discussion. It is inspiring to read about how tea fueled these influential women in history, and I do hope it can inspire us take action. Great post Sara! This has been an interest of mine too - in fact I'll be mentioning the suffragist movement in my talk tomorrow at the Toronto Tea Festival. I find the best discussions take place over tea - especially good tea! Hope it isn't too long until we can have a visit over tea. Thanks Linda! I wish I could hear your tea talk! Yes I hope we can have tea together soon. Take Care. Thank you for writing about this topic, Sara! I really enjoy your history posts. I'm definitely curious about the women of color who might have used tea drinking as a gathering and planning tool. Thanks Georgia! I have been curious about that as well. If I come across info I will definitely let you know! A very interesting posting. I, too, find the suffragettes to be of great interest. Tea and the consumption of tea does seem to appear during many historical times. Thanks Marcella! True, tea has been part of many events throughout history. Hello Sara. Thank you very much for your article. would you mind give me bibliographical recommendations on that subject? and also from the book A Social History of Tea by Jane Pettigrew and Bruce Richardson. There is a link to the book on Amazon in the post above if it's of interest. Let me know if you have any other questions!